Trash overflowing! After a long weekend, a few articles of trash found their way to the ground. It was all picked up by lunchtime the next day. One of the first things I heard from the Bavarian and German inhabitants of Munich when I first came here in 2000 was ‘Munich is a village of 1.3 million people’. Most seemed pleased with this distinction. After spending more time here, however, I discovered that a large minority of people did not share in this pleasure. Though the number of people is no longer 1.3 million but closer to 1.5 million, and according to the local mass transit company 1.7 million on Monday mornings, there are very few places in Munich where it even feels like a city at all. On most evenings the sidewalks are rolled up at about 11pm. 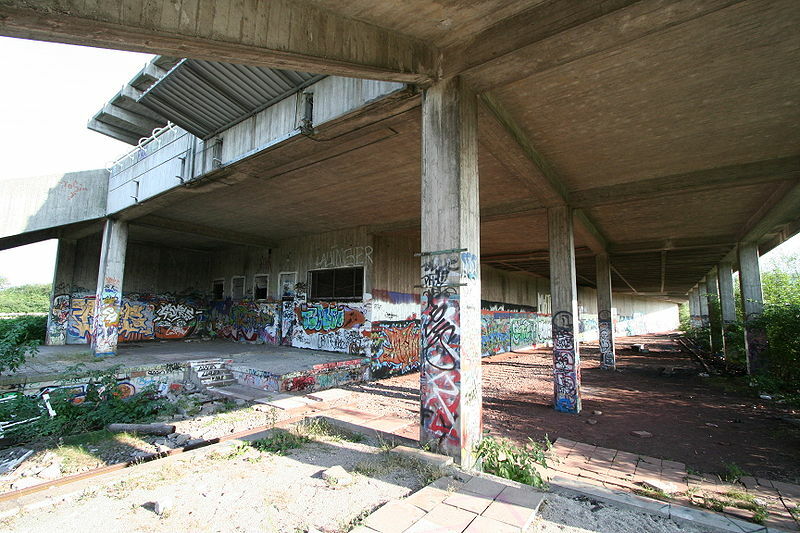 There is one central place for drunken debauchery and discos, Kunstpark Ost, and it’s scheduled for the wrecking ball in a couple of years to make way for housing and offices! What then? In ten years in Munich I’ve seen one person playing the didgeridoo. He’s local. I know him. 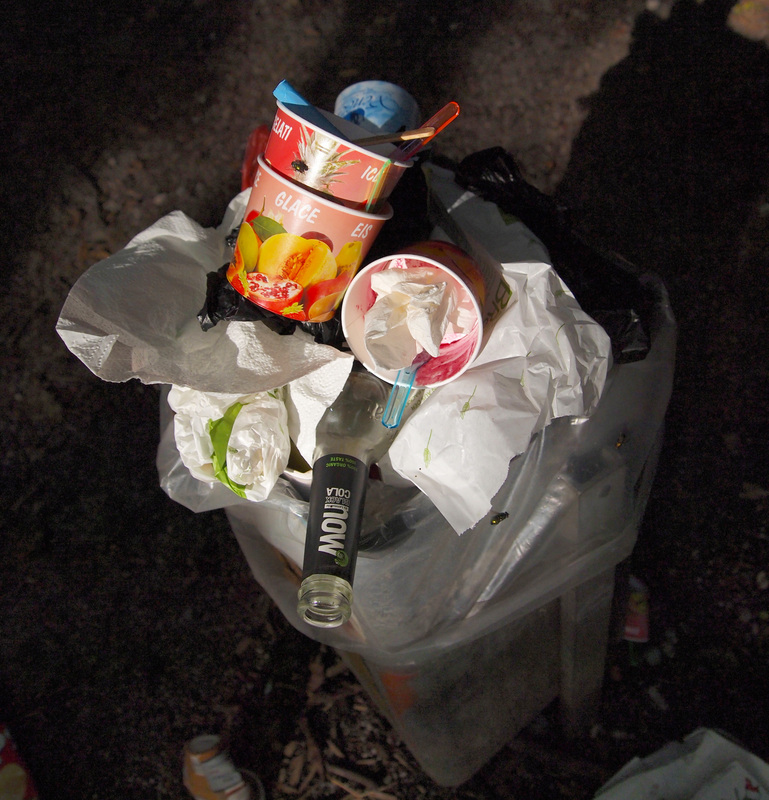 There is a dearth of trash on the streets, except for a few cigarette butts, discarded cups, and the occasional empty beer bottle. Everything is cleaned daily, there is little time for the aromas of accumulated trash to reek. Broken glass is an anomaly, graffiti is mostly regulated and even the street buskers and musicians line up daily to purchase a one-day license from the city for a specific location and time. 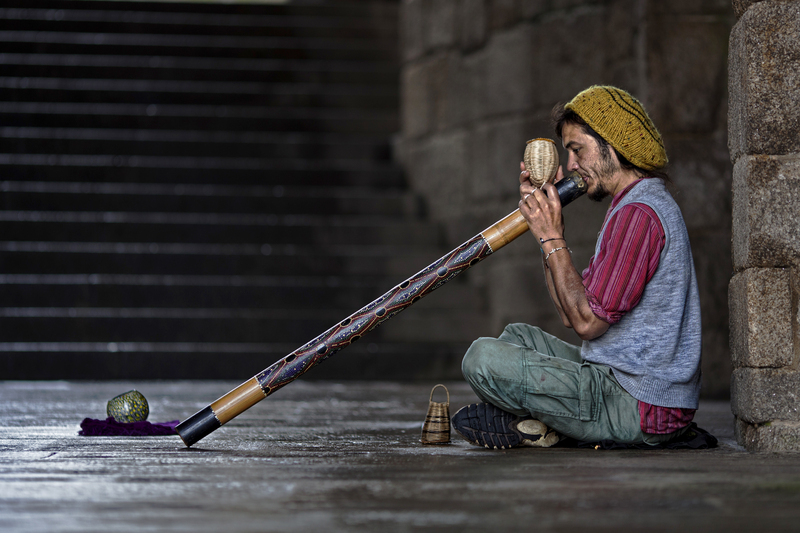 There are few ‘street musicians’, those trying to backpack the world with a didgeridoo. The musicians on the streets of Munich moonlight at Carnegie Hall. Panhandling is so uncommon that when one sees it, their mouths are left agape, but most locals feel compelled to throw in a coin or two, though few do. Graffiti, Munich style. Probably commissioned by the city. City air makes man free (Stadtluft macht frei), was a term used in Germany during the Middle Ages to explain the advantages of city life and its opportunities versus country life. In a country the size of Texas, there are 81 cities with a population of over 100,000 people. Germans are city-dwellers! What would happen if the cities were like villages? Many shudder to think! The few remaining places in Munich where one can still experience the sights, sounds and smells of a metropolis are rapidly being gentrified, revitalised or greened. For urbanophiles it’s a difficult place to call home. Even the areas along the train tracks, forever an oasis of cacophony of metal on metal, have become quieter than a Florida Swamp in winter. 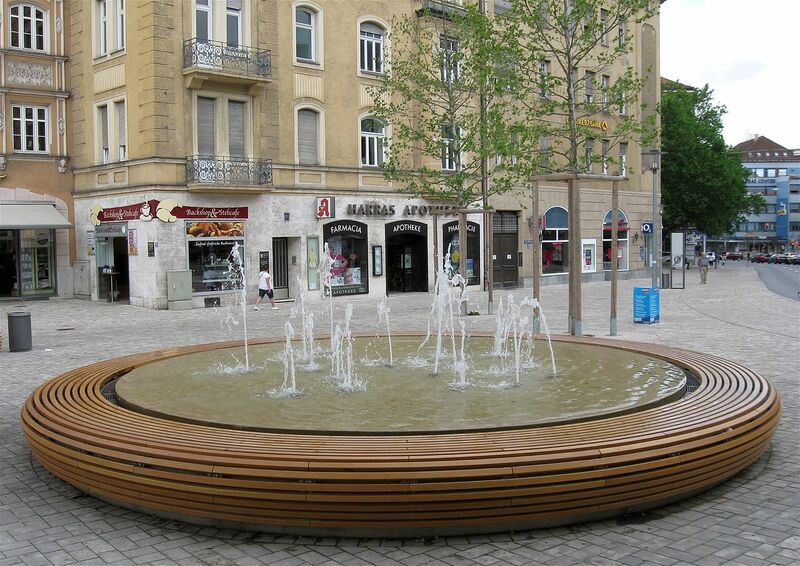 The new fountain at am Harras. Drivers complain incessantly that am Harras is a royal pain to drive through today. A few of the outer ‘villages’ have been redone and now look more like a village from the Bavarian countryside rather than a city. Moosach, Giesing and Harras are prime examples of lost urban splendor. Fountains have replaced busy street intersections. Sidewalks are cleaner than most windows. These outer-areas look more like the long ago gentrified areas of Bogenhausen and Neuhausen than urban sprawl more befitting a major world city Munich has become. For those who love the smell of diesel exhaust, these are difficult days indeed. There are even discussions taking place to bury the whole ring road! A totally carbon neutral city in two decades, would eliminate the last fumes of city life. But there are a few final bastions of city life for the urbanophile. Some real graffiti at the S-bahn station Olympia Stadion. The S-bahn station is no longer used. So there you go. As in most cities of Europe, the best place to begin your quest to find the seedy and sumptuous of a city is the central train station, and thankfully, Munich’s still fits the bill. Squinty-eyed drug addicts (and just plain drunks) greet the recently disembarked passengers from the trains, and the surrounding streets south of the station still have casinos and strip clubs. It’s even been rumored that a few street people inhabit the arcades and entranceways of local businesses afterhours. The stench is, almost, city-like, though most of it is only run-of-the-mill urine smells. If you’re into tall buildings there’s the area known as Arabella Park, though it feels more like Wall Street on a rainy Sunday afternoon. Buildings yes, life no. Hasenbergl, known locally as ‘The Ghetto’, has many more similarities to a Norman Rockwell cover of Saturday Evening Post than South Side Chicago, Watts in Los Angeles, or some areas of modern day Detroit. Terrible times for the urbanophile. The final chance to experience and live where there is the hustle and bustle of a city is wherever the tunnel project is at the moment. Munich has grand ambitions to take cars out of the city center, so every ten years or so a section of the ring road is buried underground. It takes ten years and not the normal three years because the plan is to distribute the Bavarian Government’s money over the decade, ensuring that the workers have work for ten years and not only three. It also allows for the urbanophiles near the projects to experience clanging, banging and other joys of large diesel engines for a longer period of time. Munich thinks of everybody. If you’d really like to experience those 1.5 million people, you could also go to Marienplatz in summer at 11am, 5pm or 6pm. They’re all in one place, all at one time. Oh, and don’t forget to smell the flowers. That’s what the city of Munich smells like. So, they’ve finally managed to clean up the area around the Hauptbahnof??? Only a bit, thank goodness (wink-wink)!